Ngu Hanh Son (or Marble Mountains) is a cluster of five mountains, each named after an element of Chinese Yin-Yang philosophy. Marble Mountains have long been Buddhist worshiping sites as well as a famous tourist complex to travelers from all around the world when come to Da Nang. Cham legend had it that the mountain complex was formed from a dragon egg who emerged from Non Nuoc beach. After a thousand days and thousand night had passed, the egg hatched and a stepped out from it was a beautiful girl. The egg's shells were left on the beach and grew into magical the marble mountains as we see today. Occupied on a large area, Marble Mountains still have a mysterious atmosphere of a truly historical and cultural landmark despite the impact of tourism. It's also a well-known pilgrimage site with peaks, caves, tunnels and temples all just waiting to be discovered. Named after the five elements: water, metal, wood, fire and soil, each mountain offers a wonderful sight of natural beauty. The worthiest mountain to visit in Marble Mountains must be Thuy Son (the mountain of water) which has become the sanctuary attracting many Buddhist anchorites. You should visit the mountain's pagodas and shrines outside and inside caves. Tam Thai Pagoda is the first pagoda to visit in Thuy Son. Hike up a steep slope of 156 steps to reach the three-gate entrance. Built in 17th century, the pagoda is about 400 years old, with most of its structure renovated many times throughout history. While in Thuy Son Mount, make sure to visit Huyen Khong Cave where you can see the heavenly light shining vertically through the top of the cave, touching the Buddha statues inside the cave. Hell Cave lies just opposite of Huyen Khong Cave, opening the whole another world to the eyes of tourists. It's literary Buddhist's hell made visible by the work of humans to illustrate the inevitable future awaiting for those who committed in wrongdoings. 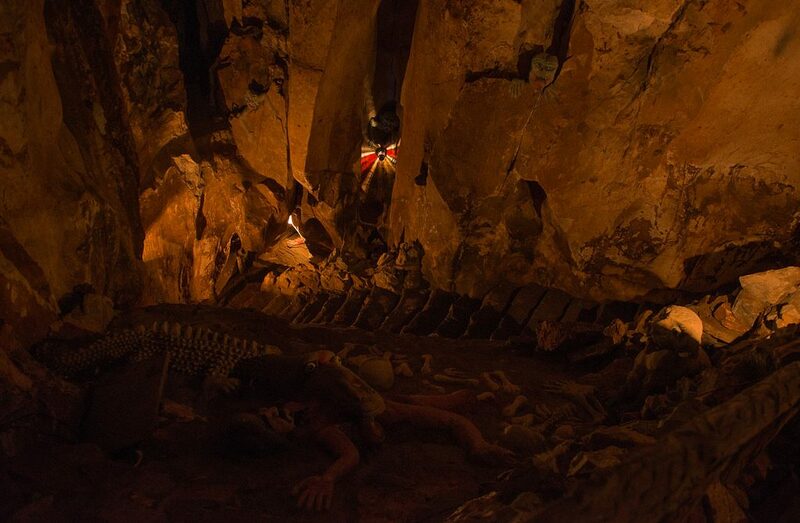 Dark, humid and filled with strange and scary creatures in the corners, Hell Cave is a place you can test your mentality. Not as dramatic as Water Mount, Kim Son or the mountain of metal has two pagodas - Quan Am and Thai Son and one Quan Am Cave. 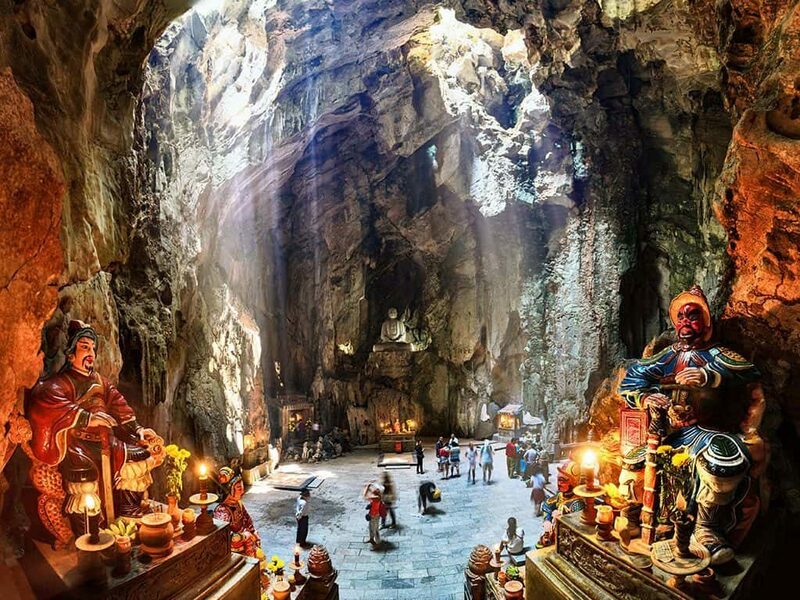 The cave is a must see spot, featuring a very well carved human-size Bodhisattva statue made of natural marble. The statue looks like and is believed a work of centuries of water abrasive process on the cave. If you have more time to spend at Marble Mountains, visit the rest of the mountains - Soil Mt., Fire Mt. and Wood Mt. 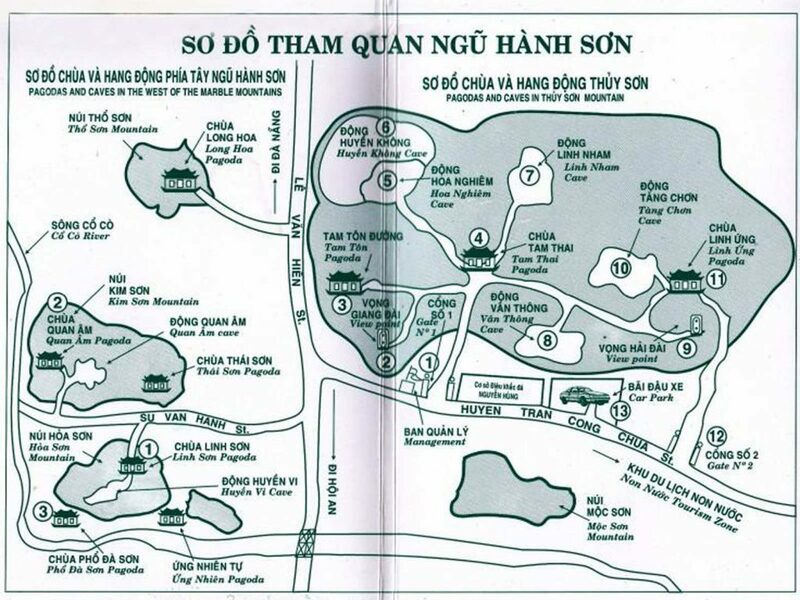 The complex is located 8km south of Da Nang city, open from 7:00 AM – 5:30 PM daily. From the city center, you cross Han River Bridge, follow Ngo Quyen street, Le Van Hien street, and finally turn onto Huyen Tran Cong Chua street. Marble Mountains can be visited during the year, but for photographing opportunities, the best time is the summer months, June - August. Take note to wear comfortable clothes before you start the trip because you will have to climb many steps. Avoid stormy season (September to November) because the steps will be slippery and dangerous when wet.